A place to discuss the uniquely delectable gift from heaven known as the West Virginia Hot Dog. 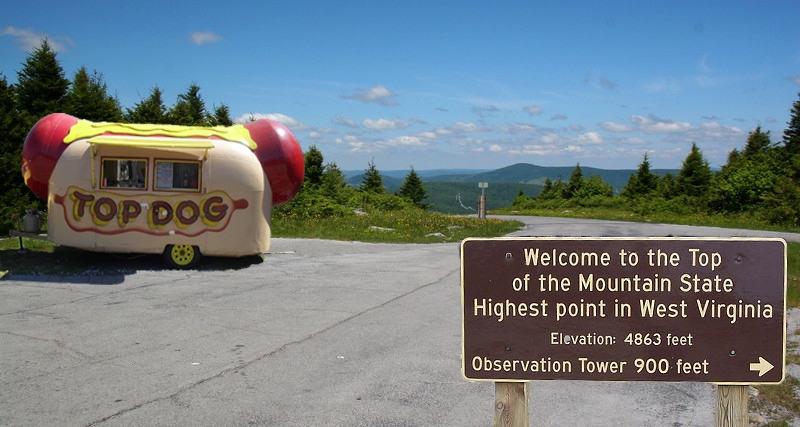 Top Dog can be found in the Spruce Knob parking lot. Perhaps the most aptly-named HDJ we've ever seen, Top Dog, situated near the summit of Spruce Knob, is unarguably above all other WV Hot Dog Joints. While a few feet lower that the 4,863 feet knob itself (the highest point in the state of West Virginia), Top Dog still must have an elevation of over 4,850, making it even higher than Cheat Mountain Dogs, one county over in Pocahontas. 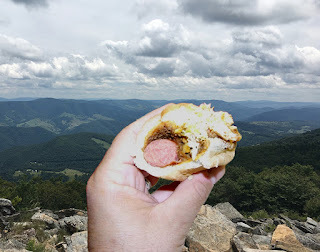 But altitude aside, we wondered how Top Dog could serve a quality hot dog in such rare air and in such a remote location. One could argue that being the only food concession within a 40 minute drive (the closest being The Front Porch Restaurant at Mouth of Seneca) would be prime real estate, but the low volume of travelers that actually make the dusty 21 mile ascent up Forest Road 112 to the top of Spruce Mountain would seem to be a significant offset. Indeed the afternoon we were there, there were no other customers to be seen. Top Dog's menu offerings are obviously meant to ingratiate them to travelers from other places, with such specialty hot dogs as Chicago Dog, Classic Coney and two different kinds of Bratwursts. But we were pleased to find a WV Hot Dog with chili, slaw, mustard and onions placed in proud prominence at the very top of the menu, and fittingly called "West Virginia's Top Dog." Interestingly enough, four spaces down the menu was a "Fairmont Dog" which was described as "A simple hot dog for the simple-minded, including overly spicy sauce, mustard and onions." While we have to admit, finding a WVHD in such a remote spot was a real treat for us, the hot dog was just so-so. Apparently the altitude affects the slaw in negative ways. While I'm no scientist, I suspect that the lack of oxygen inhibits the uptake of complex sugars necessary for really creamy slaw, so the result was a little too sweet and a bit runny. The dry air also made the bun a little too stiff for our tastes. The chili was good. The view, however, couldn't be beat. We'll give Top Dog a 4 Weenie score. It's hard to get to but worth the drive. Get an early start because you know how bad traffic can get on holidays like April Fools Day. Welcome to the W.Va. Hot Dog Blog! 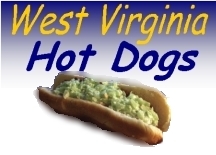 This blog contains Hot Dog Joint reviews from around West Virginia and serves as a discussion board for those reviews, as well as providing a space for general discussion of West Virginia Hot Dogs. What Is A West Virginia Hot Dog? A true West Virginia hot dog is a heavenly creation that begins with a wiener on a soft steamed bun. Add mustard, a chili-like sauce and top it off with coleslaw and chopped onions and you have a symphony of taste that quite possibly is the reason that many transplanted West Virginians can never really be happy living anywhere else. Different parts of West Virginia have variations on the theme but the common elements are sweet, creamy coleslaw and chili. Anything else is just not a true West Virginia hot dog!